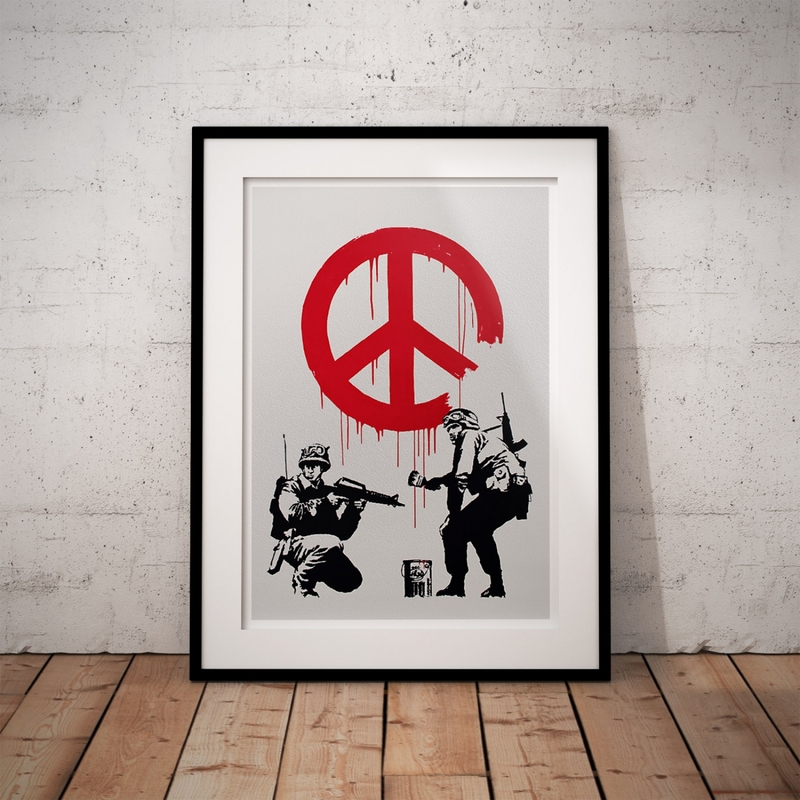 By contrasting the image of soldiers and a peace sign, a gun and a paintbrush, Banksy addresses the troubled crossroads of art and war.The artwork was initially painted near the Houses of Parliament in London and the original version was confiscated for allegedly breaking laws regarding protests in this area. 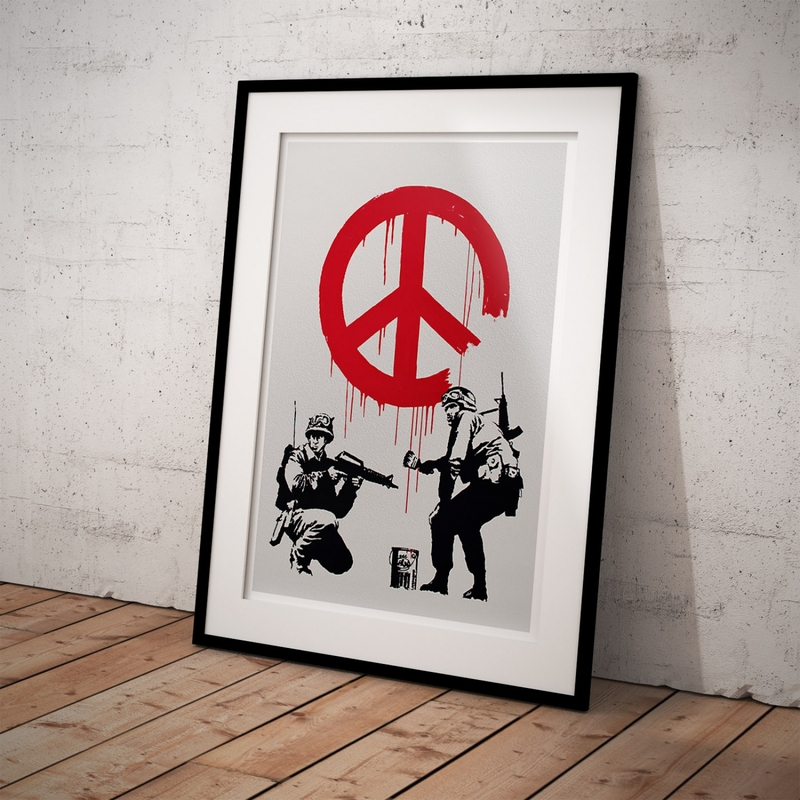 It was suggested that Banksy’s Soldiers Painting the CND (Campaign for Nuclear Disarmament) sign represented the suppression of free speech as well as acting as an anti-war protest. The piece was recreated and was displayed in a collection at the Tate Britain gallery in 2007. Enacting graffiti’s sub-culture status as physical violence against buildings and conceptual violence against ideas of social order, the image boldly asserts its disobedience. Setting soldiers alongside the peace sign makes the soldiers’ physical presence into an emblem of war, and makes a bold political statement against the dehumanisation of soldiers. 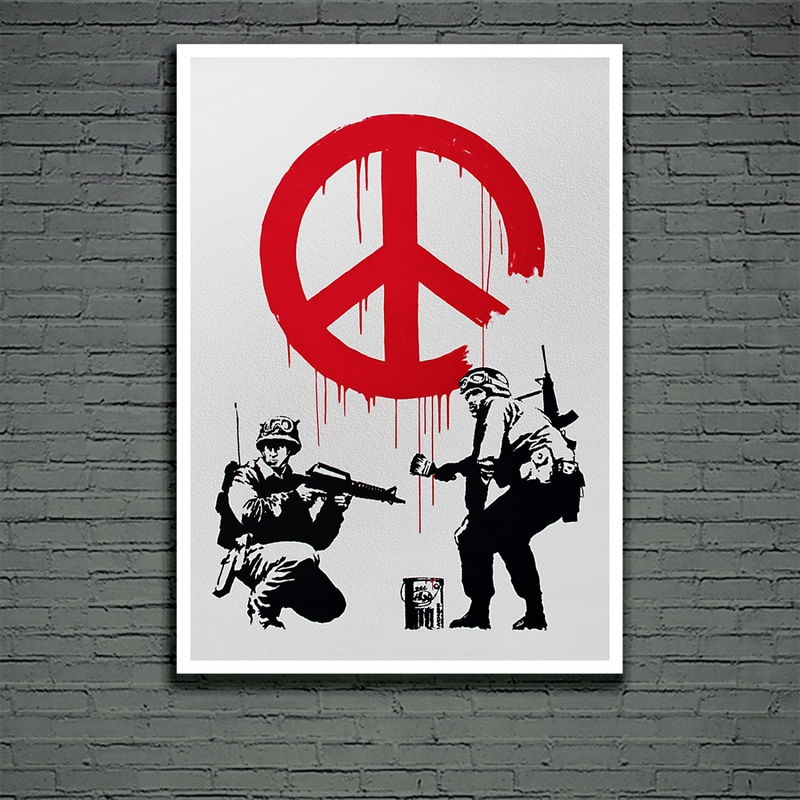 Banksy’s trademark use of black silhouettes reinforces the symbolism of red; here the dripping paint overtly references the bloodshed of war, drawing attention to the uncertain role of the military in achieving peace. The CND symbol (Campaign for Nuclear Disarmament) was designed in 1958 by the late British designer Gerald Holtom (1914-1985). 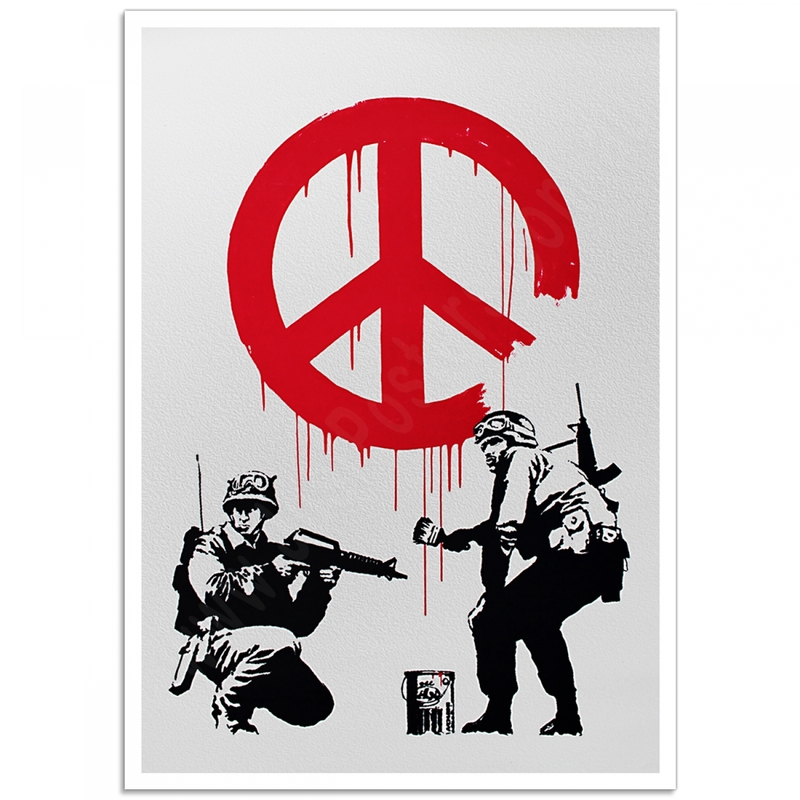 This distinct symbol has reinforced the message for millions of protesters over many years. Gerald initially considered using the Christian cross symbol within a circle but eventually settled on using letters from the flag semaphore system, overlapping N(uclear) on D(isarmament) within a circle that symbolised Earth. Gerald Holtom wrote to Hugh Brock, editor of Peace News and offered his intimate reasoning for the idea. 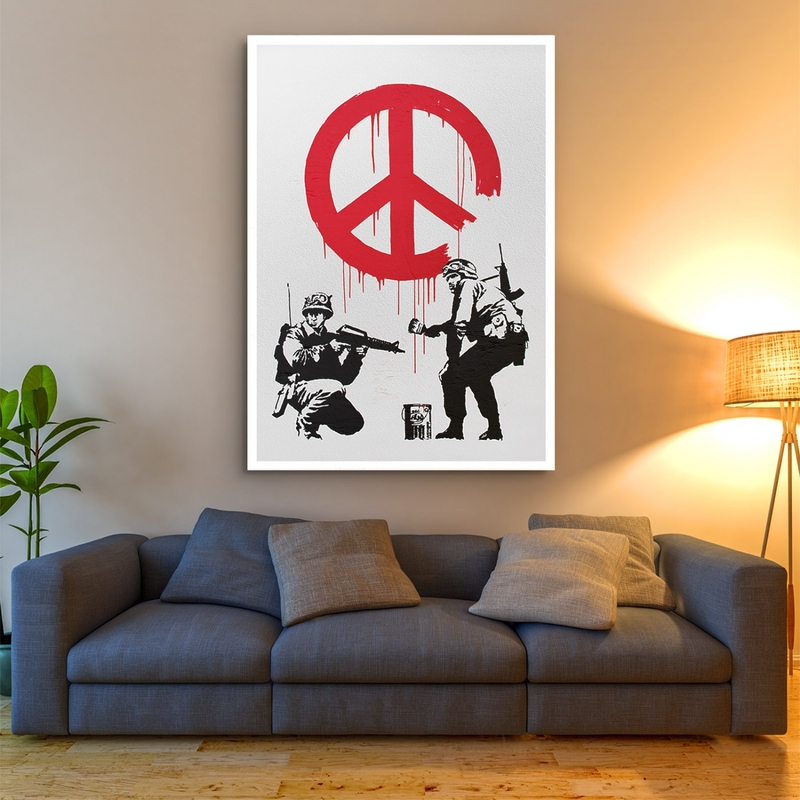 The "Banksy, CND Soldiers" poster was created from an original photograph. Follow Your Dreams - Street Art Poster"Follow Your Dreams", a thought provoking poster by Banksy.The..
Peace Love Doctor - Street Art PosterBanksy Street Art tells a story and Banksy has powerful stories.. Kissing Coppers – Brighton Street Art PosterBanksy Street Art tells the story Banksy’s “Kissing Copp..